Atal Bihari Vajpayee BR ( 25 December 1924 – 16 August 2018) was an Indian politician who served three terms as the Prime Minister of India: first for a term of 13 days in 1996, then for a period of 13 months from 1998 to 1999, and finally, for a full term from 1999 to 2004. A member of the Bharatiya Janata Party (BJP), he was the first Indian prime minister who was not a member of the Indian National Congress party to have served a full five-year term in office. 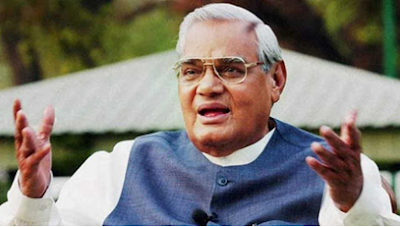 From being one of the earliest members of the Bharatiya Jana Sangh, Vajpayee blossomed into a leading opposition MP by the late 1960s, went on to become External Affairs Minister in the short-lived Janata government and, finally in 1999, to head the first non-Congress government to complete a full term in office. That it was a coalition government made the feat all the more remarkable and testifies to the fact that though wedded to a right-wing political ideology, Vajpayee did not believe in the politics of exclusion. A protege of Jana Sangh stalwarts like Syama Prasad Mukherjee and Deen Dayal Upadhyaya, Vajpayee won the admiration of Jawaharlal Nehru, was consulted by his daughter Indira Gandhi - whom he never lacked the courage to criticize-and befriended by fiery trade unionist George Fernandes even before they became political allies. He thus displayed an unusual ability to carry along all shades of political opinion - an ability that came to the fore when he headed the National Democratic Alliance government between 1999 and 2004. And behind this public persona was an unusual personal life, conducted with such dignity as to remain free of innuendo.